Meet Patty Gii and Keith Shanks, the Rottweilerrescuin’, wine-lovin’ husband and wife team behind Rott n’ Grapes (www.rottngrapes.com). The wine and beer bar serves over 90 different grape varietals. The couple first played with the idea of opening their own bar over glasses of wine in Italy. Throughout both of their careers, they aided in startup business for other people. This time it was their turn. The couple traveled to wine meccas, including Napa Valley in California and San Gimignano in Italy, immersing themselves in both regions and cultivating an appreciation for wine and craft beer. “Italy is calling. They said we are overdue for a visit,” Shanks laughs. 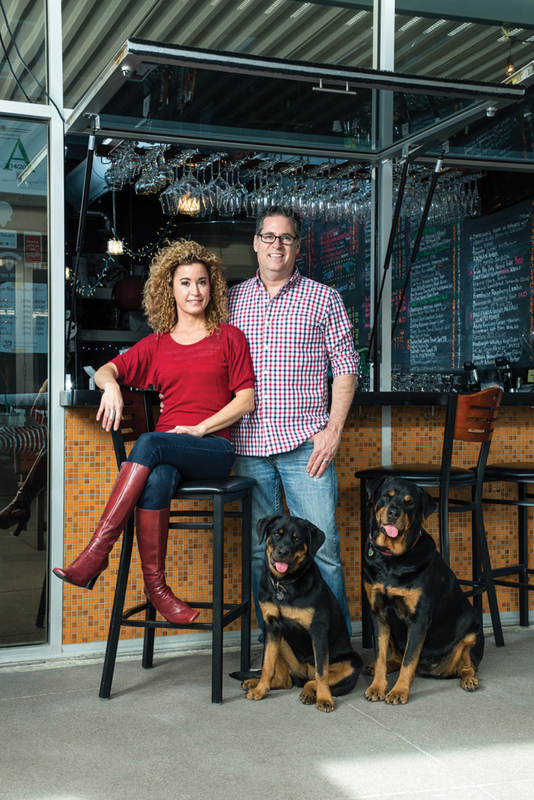 After extensive research that involved a lot of sampling, they opened Rott n’ Grapes – a namesake for their two passions: Rottweilers and wine – in June 2016. Shanks is the numbers, handling growth strategies and investments. Gii, as the creative, is the brand and marketing manager. Their strengths come together to create a fun environment where picking out wine (and craft beer) is approachable and enjoyable. “We want our locations to feel warm, welcoming and comfortable. Thus explaining our slogan, ‘Make America Grape Again,’” Gii explains. The couple is slated to open a second location on Roosevelt Row this summer, which is four times bigger than the original spot on Central Avenue. Just last month, they launched a wine club for people who want to expand their vino knowledge. The couple anticipates more opportunities to come at the larger location with one being a potential beer club. “The American dream is doing something that you really enjoy. At Rott ‘n Grapes, we are being the man instead of working for the man. The best part is that we get to do it together!” Shanks explains. In addition to wine, the pair also advocates for dogs. They have rescued countless Rottweilers throughout the years. Their current fur babies are Onyx and Dolcetta. HALO Animal Rescue, a local non-kill facility, and Veterans of Foreign War – Shanks served as a Naval officer for 15 years – are a few of their favorite organizations. “Every year, we raise money and donate to these organizations either through raffling off items or in-house contests,” Gii says.